You’re engaged! You’ve just experienced one of the most extraordinary events of your life and you have a diamond ring on your finger to keep that memory alive. Now it’s time for the wedding planning to begin and the first question you need to ask is ‘where should we get married?’. Well if you’re looking for an iconic location that is home to one of the world’s Seven Natural Wonders; has been ranked by various publications as a must-visit destination, and caters for every matrimonial need, then you can’t go wrong with a wedding venue in the Western Cape. Home to some of the world’s most astounding flora and fauna, set against a backdrop of crisp, blue mountains; white sandy beaches and deep, green winelands, it doesn’t take much to understand the attraction of this coastal gem as a wedding venue. So now you’re convinced, the wedding will take place in the Western Cape but, being a world-class wedding destination, wedding venue options are seemingly endless. Hotel and beach wedding venues are always great, but what makes this area truly unique are the scenic wine farms that provide an ideal setting for your magical day. Offering couples both indoor and outdoor wedding venue options, many wine farms have onsite facilities including catering and accommodation for all your needs. And the setting is every photographer’s dream, with an array of stunning backdrops to capture the day in all-weather types. In addition, the Cape Winelands is one of the world’s top 10 wine-producing areas and many couples like to incorporate wine tasting into the day’s festivities. You are also guaranteed to have a fantastic wine selection to celebrate your nuptials. The cosy wine cellars, surrounded by beautiful oak barrels and bottles of quality wine also provide a gorgeous alternative for ceremonies, particularly in the colder winter months. And while the Cape valleys feel completely isolated from the vibrant city life – a sparkling bubble encapsulating you in this utopian setting – they are still extremely accessible for wedding guests with the city centre an easy drive away and Cape Town International Airport a mere 20 minute drive from the Cape Winelands, especially the first and foremost Stellenbosch Wine Routes, our country’s forever young granddaddy of wine routes. Now you’re getting closer to pinning down one of the biggest factors that will influence your wedding day, but there’s still one more step. Which wine farm to opt for? Luckily that decision is not a difficult one. 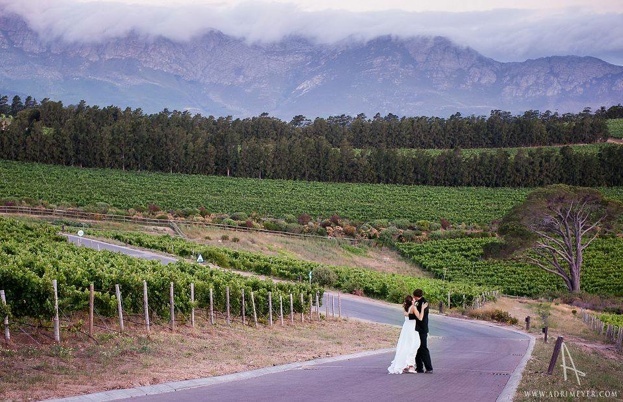 Waterkloof is the picture perfect Winelands wedding venue. Providing an exquisite setting ‘in the sky’ to tie the knot in style. Waterkloof specialises in sophisticated, intimate weddings at its magnificently appointed restaurant and tasting lounge. 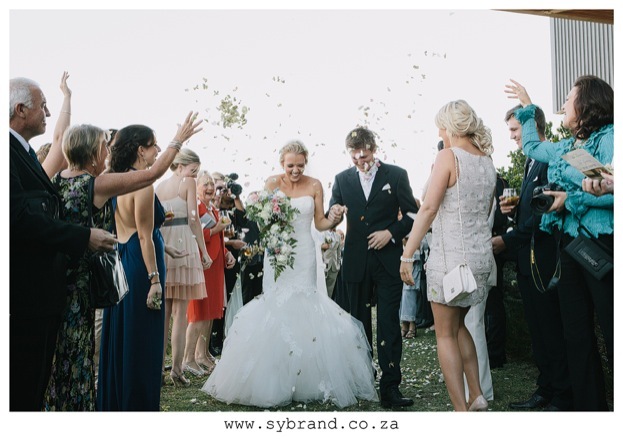 Perched high on the slopes of the Schapenberg outside Somerset West, it is a spectacular wedding venue for a chic ceremony and reception in one place. Waterkloof’s tailor-made wedding venue packages combined with sheer decadence, personal service, elegant estate wines and unsurpassed contemporary cuisine ensure that the bride and groom share a truly personal, unique and moving celebration with their friends and family. This is all served up with omnipresent views of the wine estate’s amphitheatre of vineyards and False Bay in the distance. Bridal bliss guaranteed and no bride or groom could ask for a more scenic wedding venue. Ceremonies are hosted in the glorious Barrel Room or outside on the lush lawns overlooking the farm and mountains. The restaurant, which is acclaimed for its exquisite cuisine, crafted by leading Chef Gregory Czarnecki is set against the enchanting vineyards with the glistening ocean in the distance. The stylish reception area serves as Waterkloof’s iconic ‘Restaurant in the Sky’ which is a 10-metre high glass outcrop extending from the stylish wine-tasting lounge and cellar. Waterkloof’s elegant range of wines effortlessly matches with contemporary classics, fully complementing the food. As the seasons change, so does the food on offer, as every meal is prepared using fresh, locally-sourced produce. If you are looking for a unique, elegant and sophisticated wedding venue in the Cape, then Waterkloof Wine Estate is the right wedding venue for you. Fill out your details below and the PDF Wedding Brochure will be automatically downloaded. With your dream wedding venue ticked off, everything else will now fall into place. 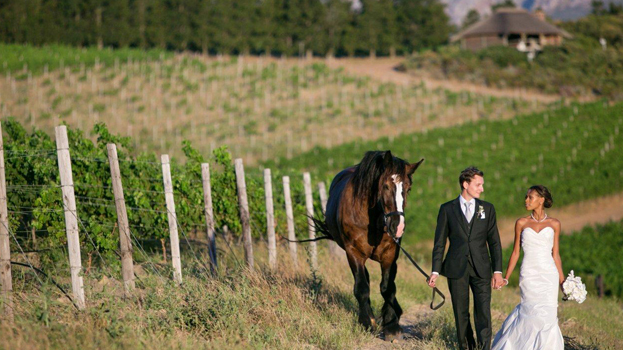 Contact Waterkloof Wine Estate today to discuss your dream wedding. Photos courtesy of Adri Meyer Photography, Yeah Yeah Photography. All at Waterkloof Wine Estate.